We have heard the Saying, Habits make or mar a person. Our parents always stressed on good habits, as they were worried we might be stuck in our bad habits, and they can hold us back from greatness. Is this really true? Can a bad habit, really stop a person from achieving great heights? If I am always feeling lazy, and keep postponing my activities, eventually I will miss on it, by doing shoddy work, due to lack of time. Now since this is a part of my personality, I would really be doing this every time. What if I had worked on this habit of mine, in childhood itself. Definitely, I would be a much different person today, isn’t it? So what if I realize it now, and want to work on it. Well, I can, but with great struggle, I might be able to rectify myself, and again not completely. Some part of this habit will stay with me. That is the reason, in fact, people who are struggling to lose weight, fail in a couple of days. Due to their habits, of binge eating, overeating, or simply not exercising, they fail miserably, every-time. And we all know changing habits, as adults, is a hell lot of work. So am I stuck with me, for life? 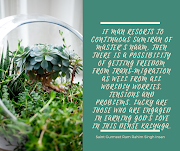 Mostly yes, but with meditation, and the right meditation, one can get out of this trap, and increase self-control and will power needed to break this cycle. 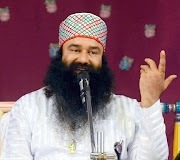 Meditation, taught at Dera Sacha Sauda’s Sirsa Ashram, has really helped me, gain more will power and more control over myself. From controlling my temper to finishing tasks on time, even my sleep patterns, I have mastered them all. This Meditation is taught by only Baba Ram Rahim, where a person takes his full concentration, to his tenth door, which is the concentration point, between two eyes, while uttering God’s words, in your mind. With this simple practice, one can take its soul, to this point. This will take practice, for about 1 -2 months, and once you (soul) reach this point, your body feels light and rejuvenated, calming your mind to a great extent. Millions of followers of Baba Ram Rahim Guru, are following this practice, from all walks of life, and they are the most content, calm and beautiful souls, I have met. I am really glad and thankful to have found this new way of attaining a meditative state, which works at all levels, including mind, body and even the soul, is transformed. 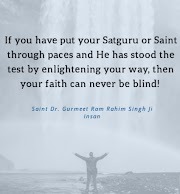 In fact, Baba Ram Rahim claims that one’s soul can traverse into higher consciousness and see the entire universe, as it makes it to higher, worlds, and even visualize God within oneself. This may take months or years based on each individual’s karma and other factors.